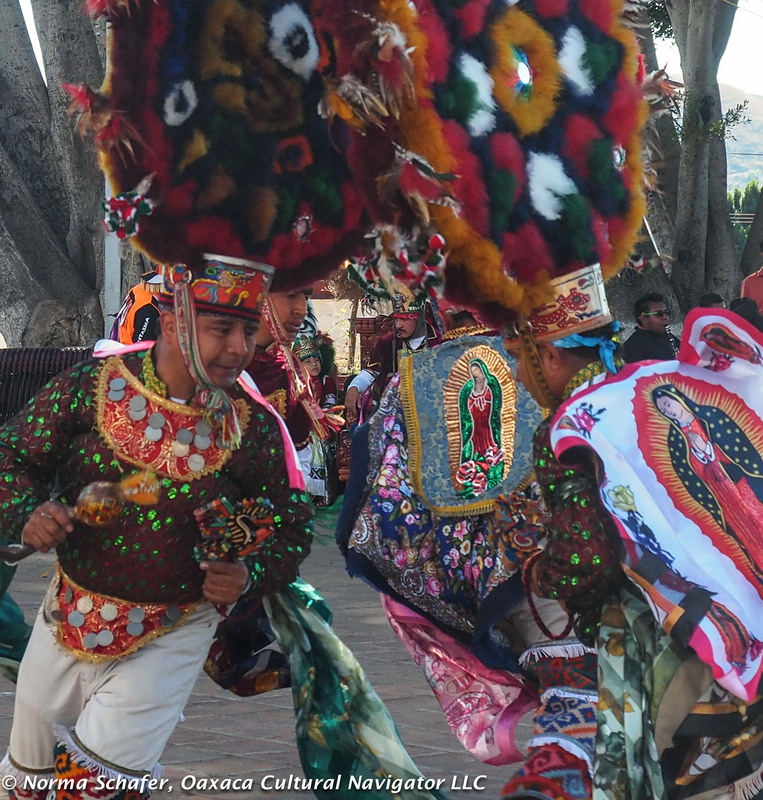 Teotitlan del Valle‘s Los Danzantes are famous throughout the Valles Centrales de Oaxaca. 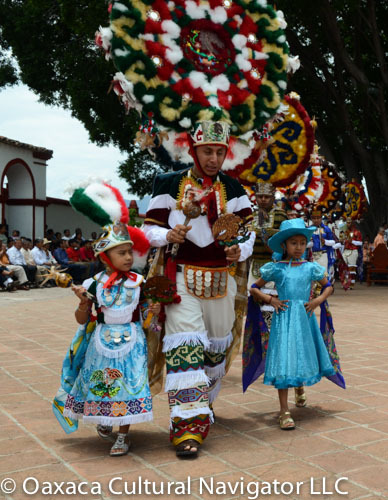 They make a commitment to the church four years before they actually begin their three-year term to perform La Danza de la Pluma — The Dance of the Feather — at all village festivals. 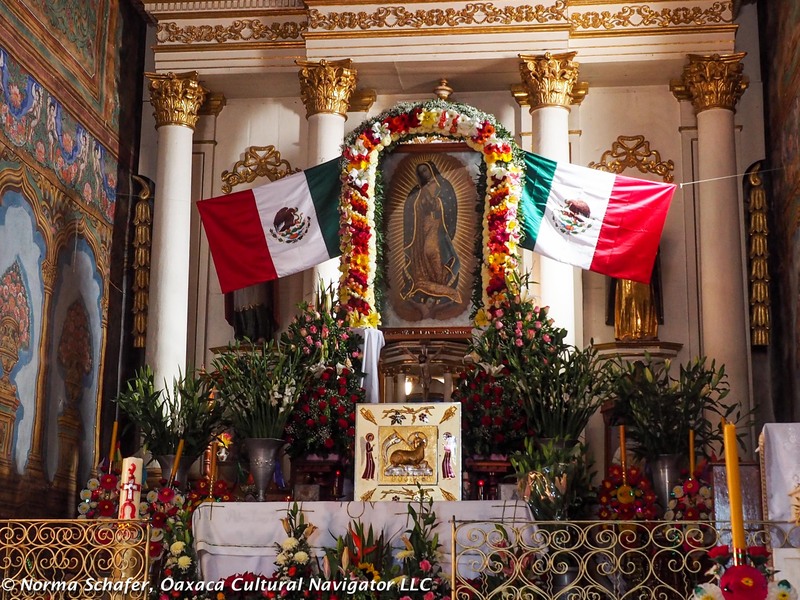 Honoring the Virgin of Guadalupe, Queen of Mexico, on December 12 and the days leading up to it, is an important part of their agreement. 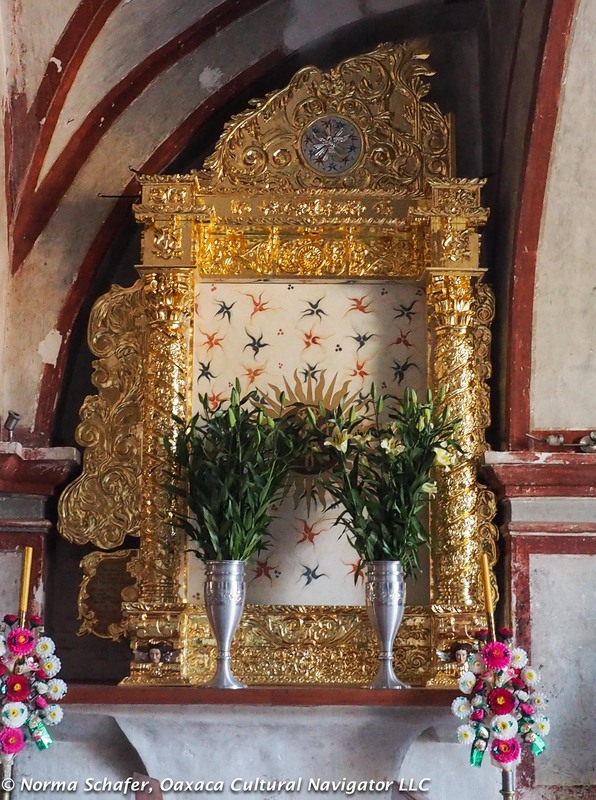 On December 12, the Virgin’s Feast Day, the Dancers gathered in the church courtyard at around noon and continued with intermittent breaks until 8:00 p.m., when they went to the house of the Mayordomo Fidel Cruz for respite and supper. These celebrations are important on many levels. 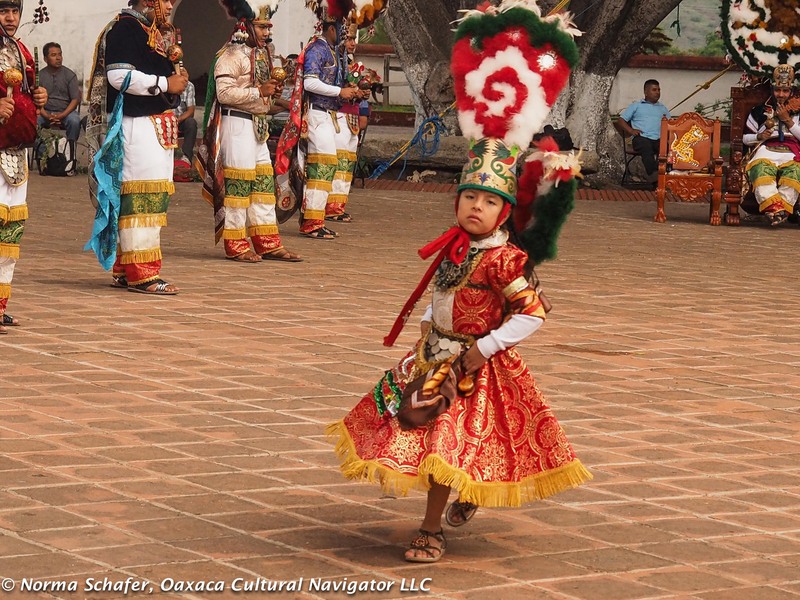 They continue long-standing traditions, many of which pre-date the Spanish conquest. 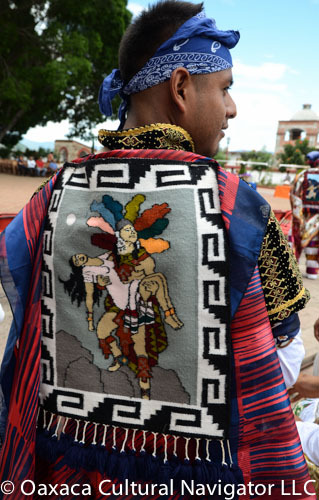 They reinforce community, build cohesiveness among the young men and their families, they honor church and tradition, and they attract tourism — an essential part of this Zapotec rug-weaving village. It is almost impossible to visit here for the first time without going home with a beautiful tapestry. 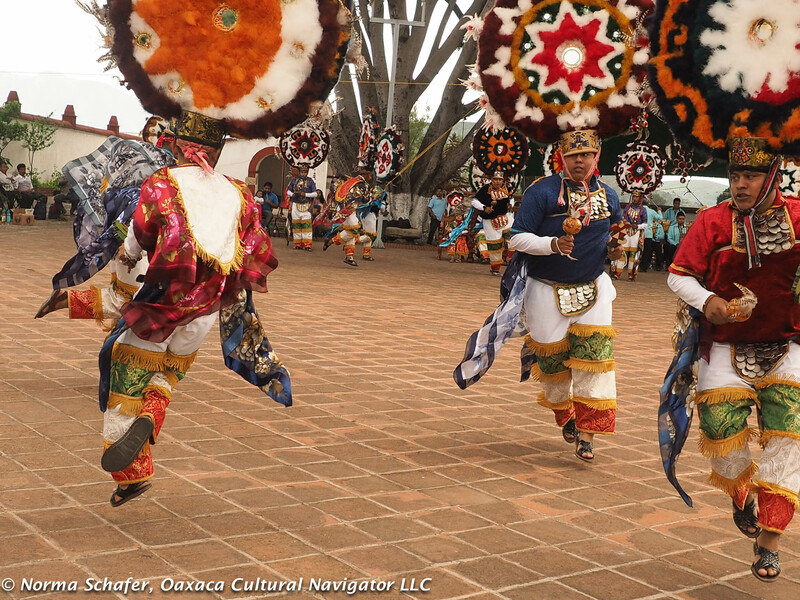 The weaving culture is reflected in the dancers’ leggings and on the shields they wear. 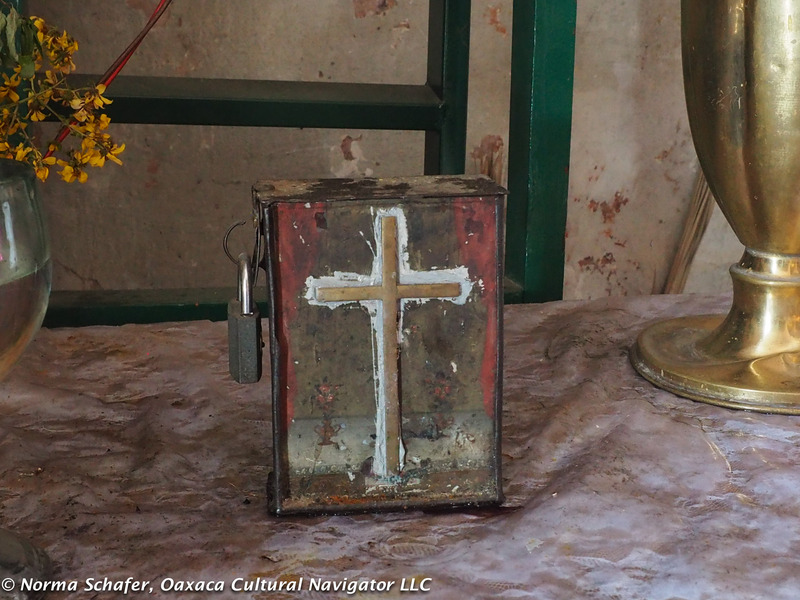 Many of them use pieces that were made by fathers and grandfathers twenty or more years ago. 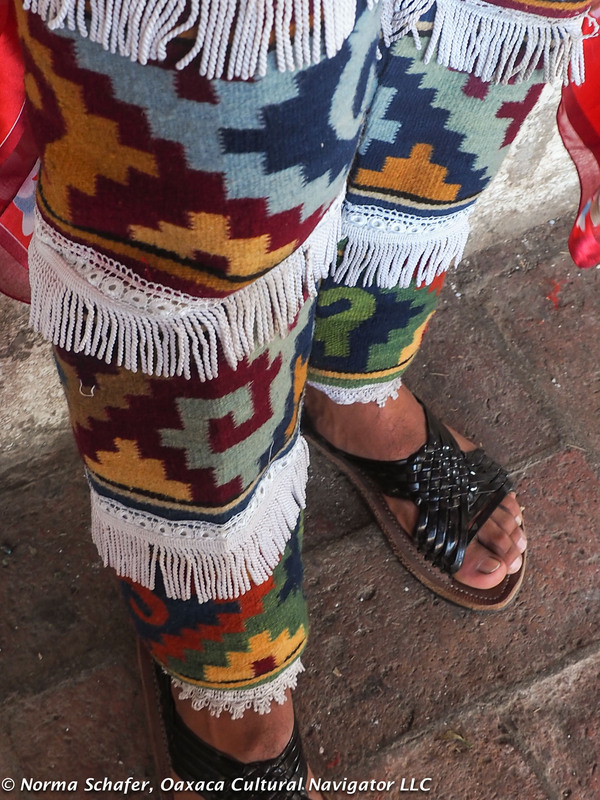 If you look closely, the weaving is fine, detailed and is a work of art. As I stayed through the afternoon, I caught some of the long shadows as the sun set. 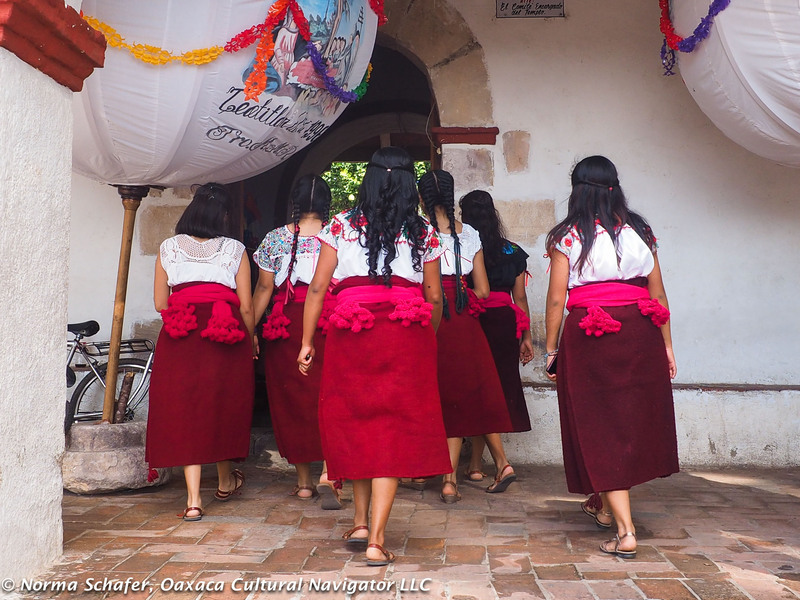 After so many years of taking photographs of Los Danzantes leaping, shaking rattles, demonstrating their fortitude and strength, I was searching for a way to capture the scene in a different way. 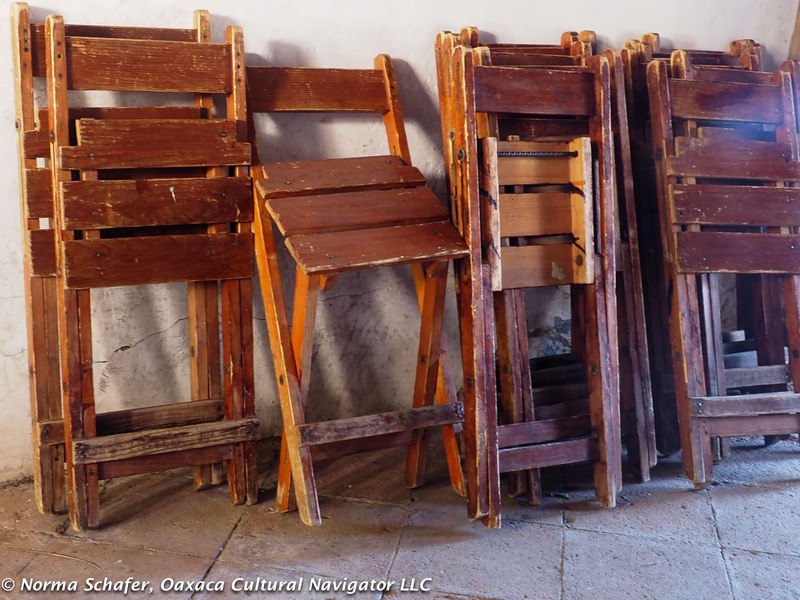 As the important village usos y costumbres committee members entered the church courtyard, many visitors, including me, moved to the periphery to give them seats of honor. 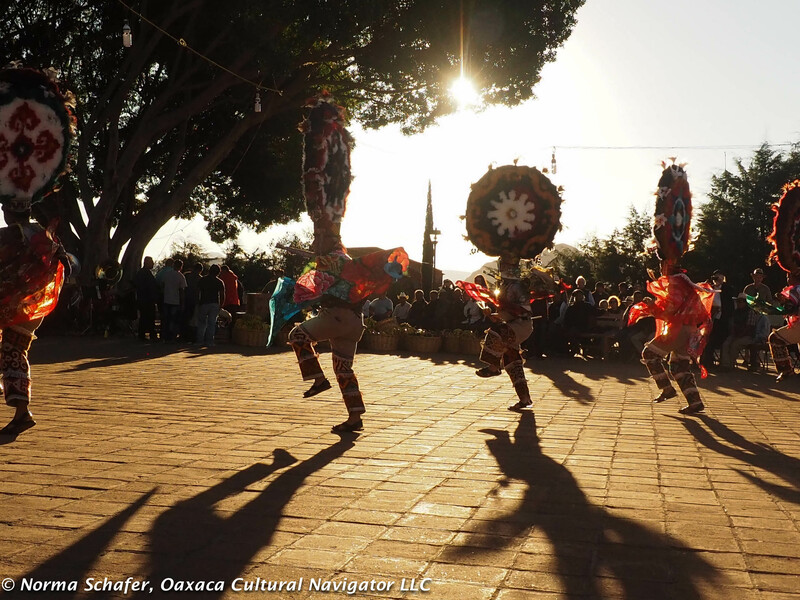 As I moved around the circumference, I noticed how the shadows of the dancers became an extension of their bodies in the backlight of late afternoon. 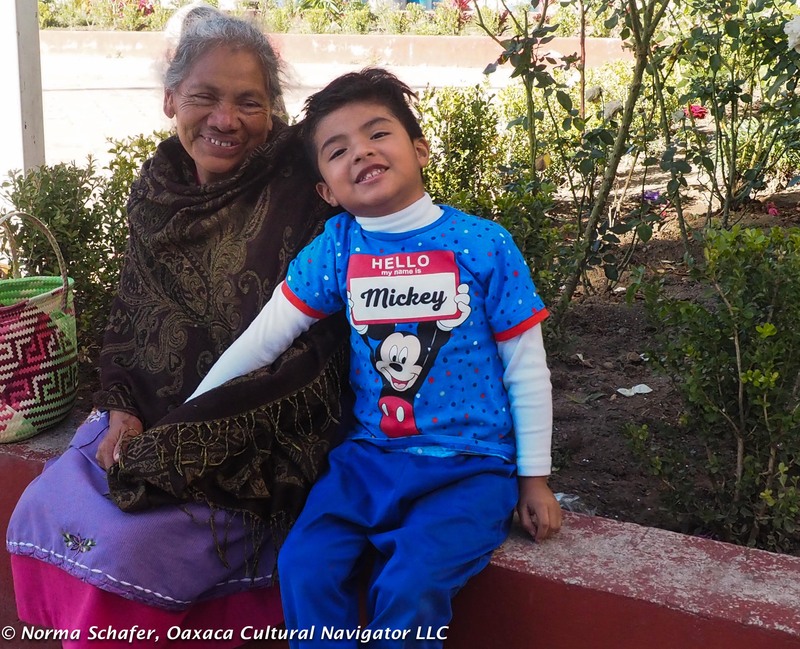 Grandmother and grandson watching. The young ones dream of becoming dancers. 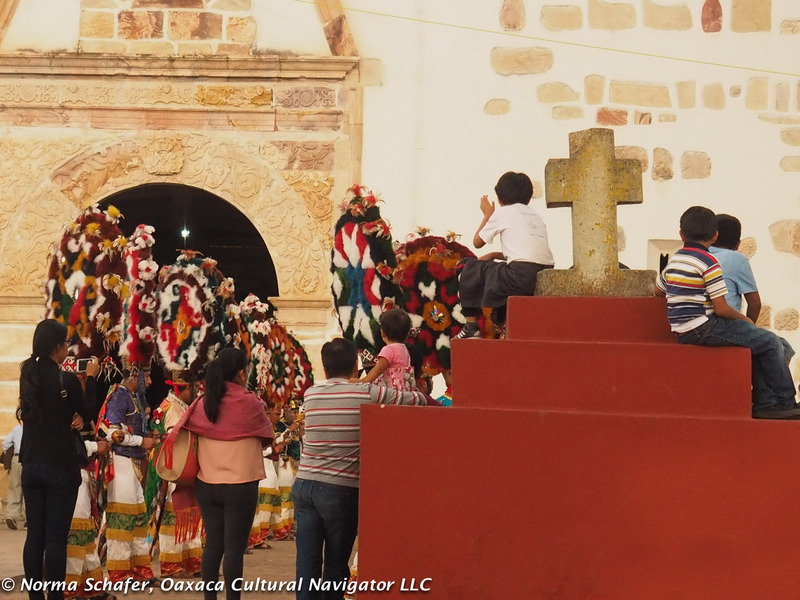 Children play atop the courtyard cross. 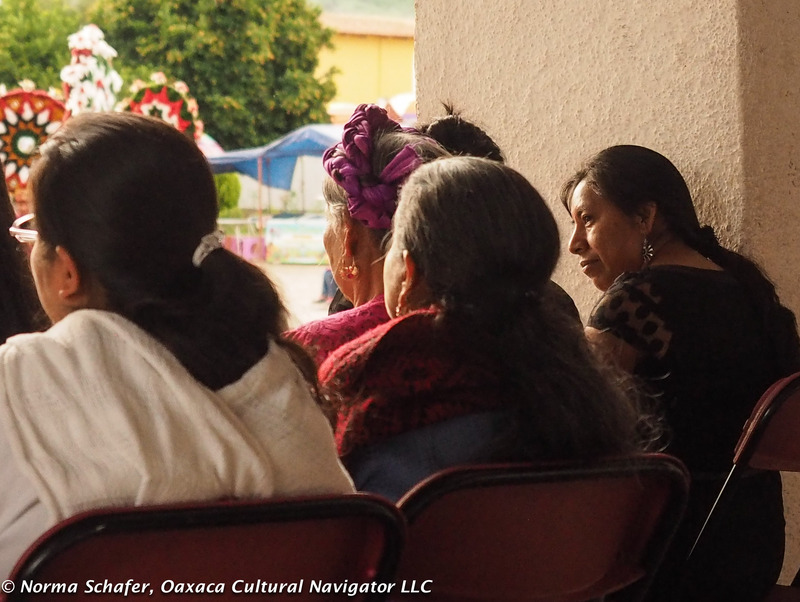 The Oaxaca Lending Library brought a group to watch. All visitors welcome! 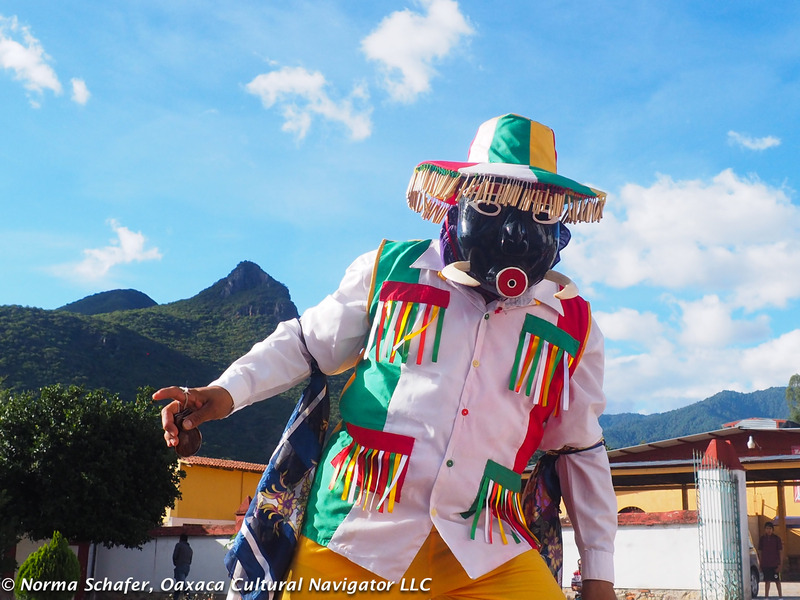 Send In The Clowns: Teotitlan del Valle, Oaxaca, Dance of the Feather Distraction? Who are these clowns? 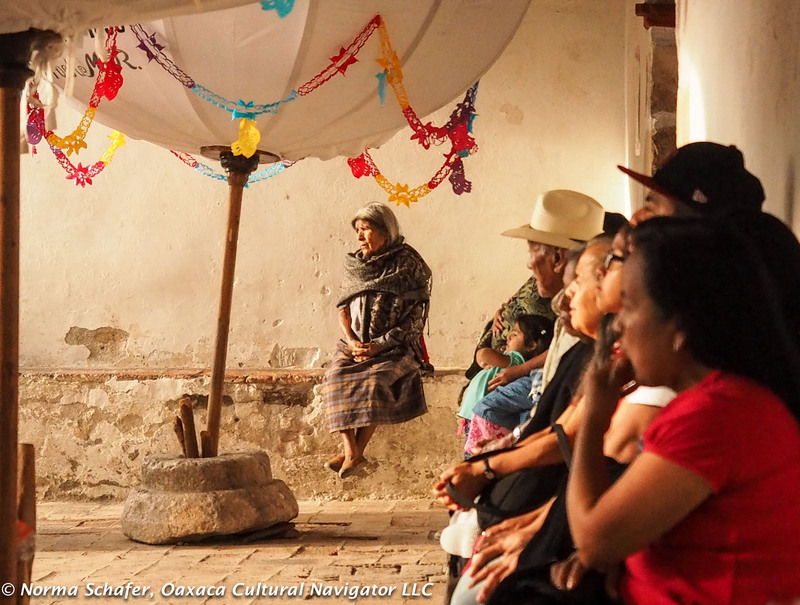 What purpose do they have in the Conquest of Mexico story? 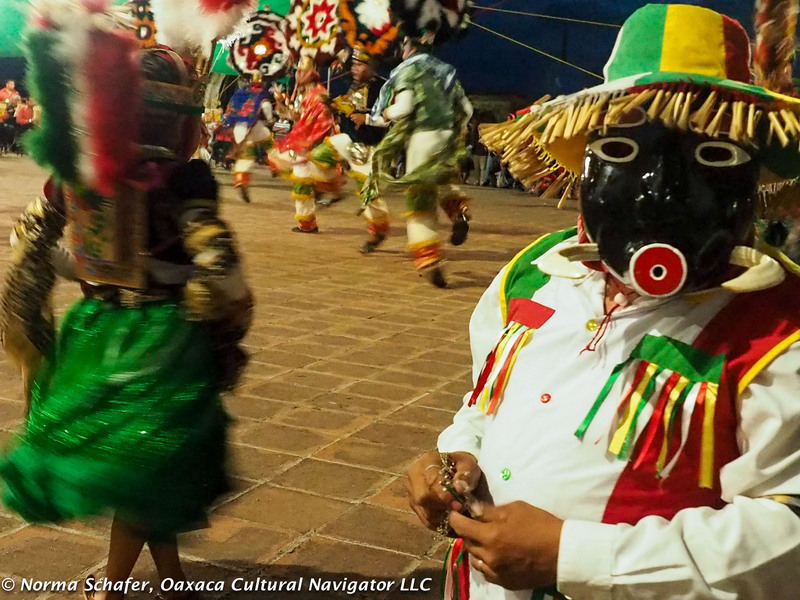 The clowns are an ever-present, necessary part of the Dance of the Feather — Danza de la Pluma — story that recreates the Moctezuma-Cortez clash that we know as The Conquest of Mexico. 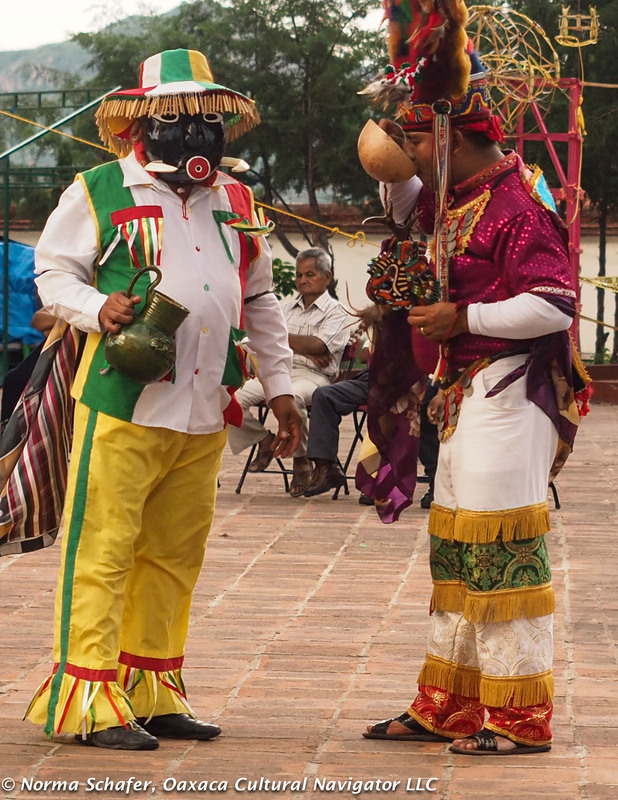 The distracting Clown, with La Malinche in background. Little is written about these clowns. 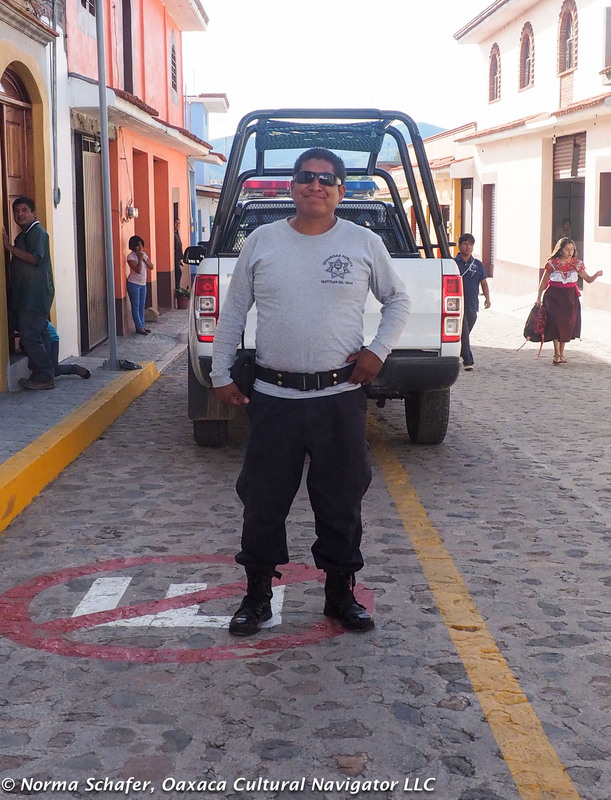 However, I have the good fortune of knowing Moises Garcia Guzman de Contreras who lives in San Jeronimo Tlacochuaya, just up the road from me. 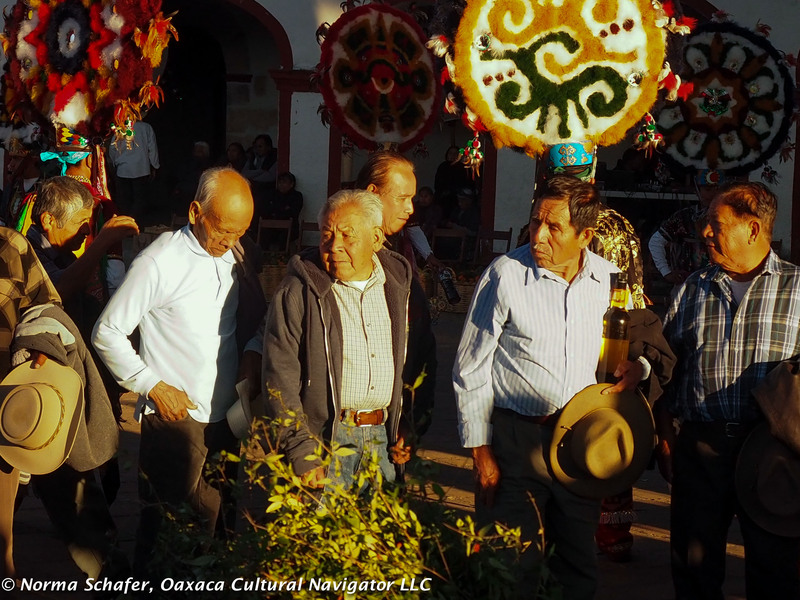 Moises is very knowledgeable about Zapotec history. 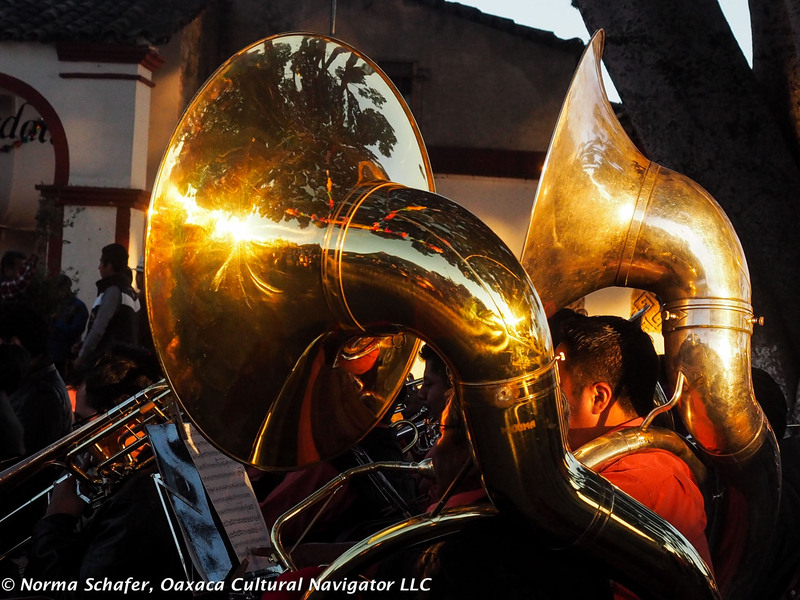 At dinner yesterday, he told me the musical score to the dance probably written in the late 19th or early 20th century, when the oompahpah German music became popular in Mexico. Others attribute it to the French. 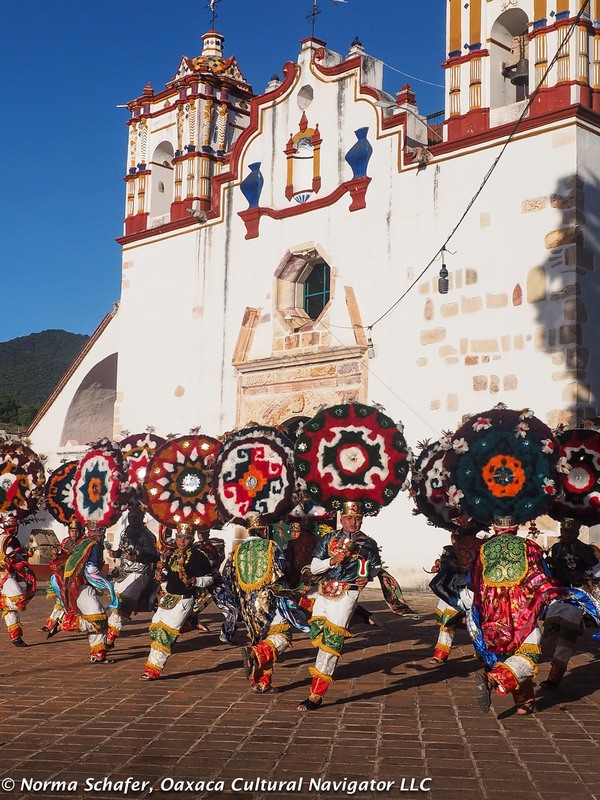 The dance is likely rooted in pre-Hispanic ritual and practice, incorporated into village feast days to celebrate the church throughout the Valles Centrales de Oaxaca (Central Valleys) after the Conquest. Quenching thirst is only one Clown task. Keeping the dance area clean is another. The pair of clowns, with the chair dance. There is a prescribed sequence to the days of the Dance. Each day features a different path of the story line, until the last day, when the conquest is brought to conclusion. 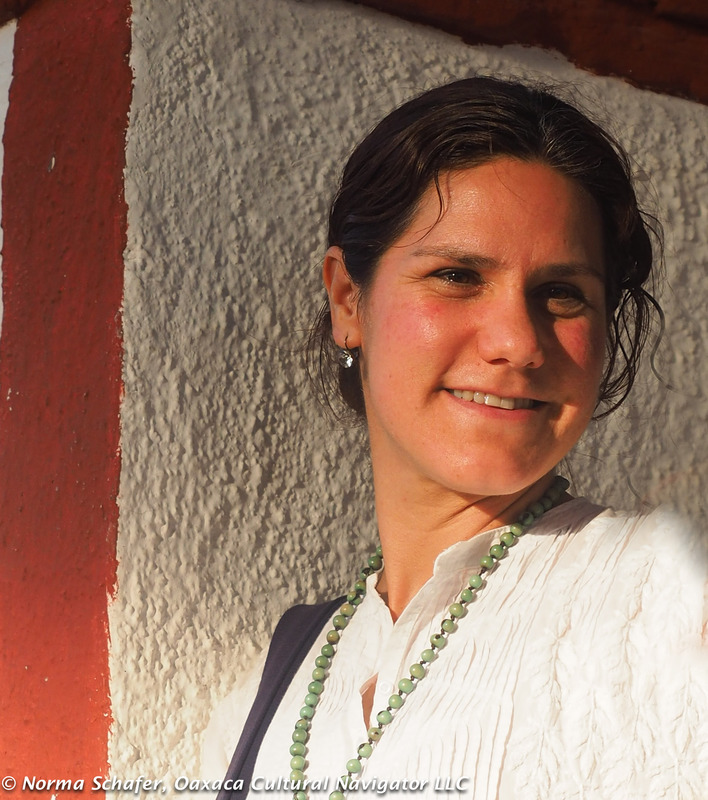 In the end, as the story goes, Mexico thrives because of her strength in syncretism — the blending of two roots, indigenous and Spanish, the union of Cortes with La Malinche, producing a son named Martin, which defines the beginning of the modern state. 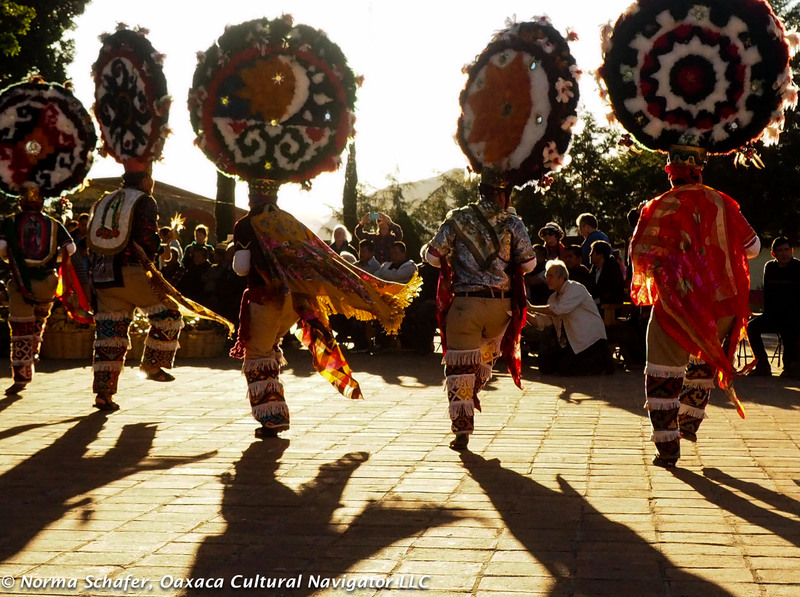 The Dance of the Feather — Danza de la Pluma — is a cultural phenomenon in the Valles Centrales de Oaxaca — Oaxaca’s central valleys. 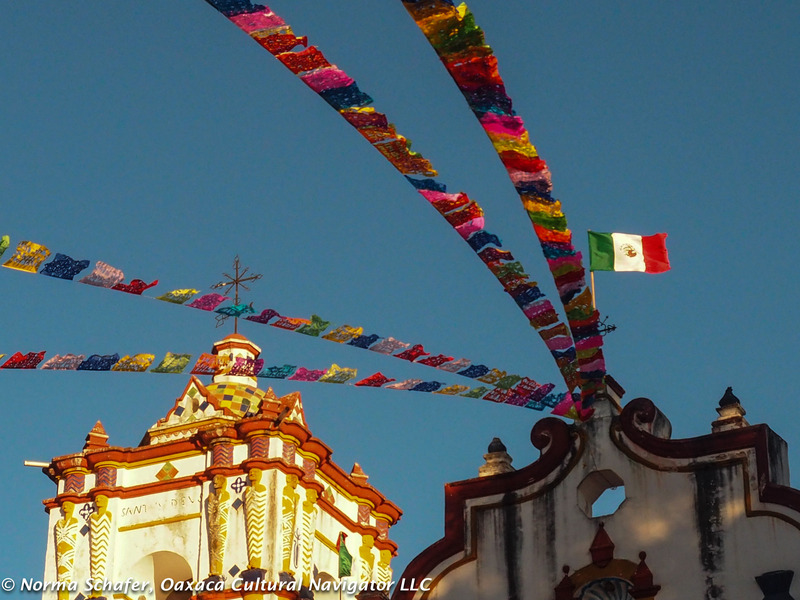 It’s especially true here in Teotitlan del Valle where the church feast day celebration is perfected to an art form. 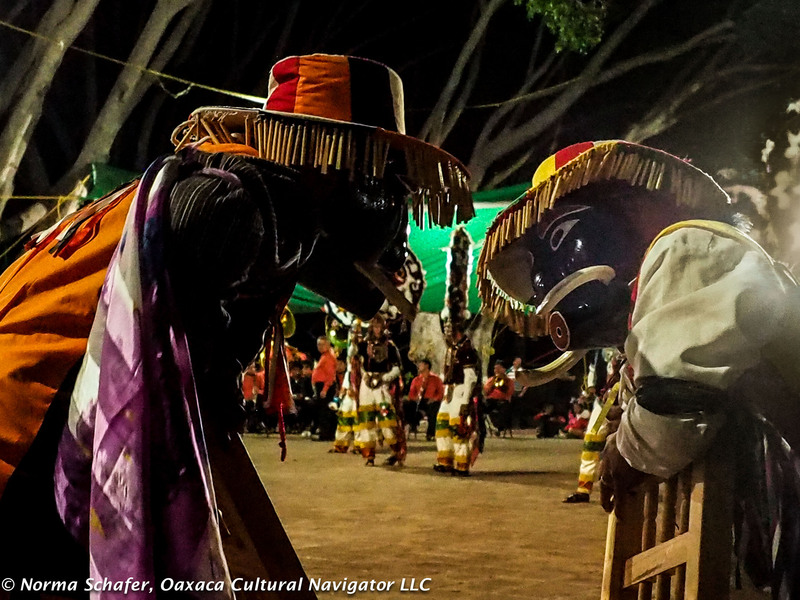 If you are in Oaxaca now through the weekend, you will want to come out either today, July 5, or Saturday and Sunday, July 8 and 9, from 2 until 9 p.m. when the dancers will act out the complex story of the conquest, and the battle between the Aztecs and Spaniards. I’m told that it’s the indigenous people who always win in this version of the story! 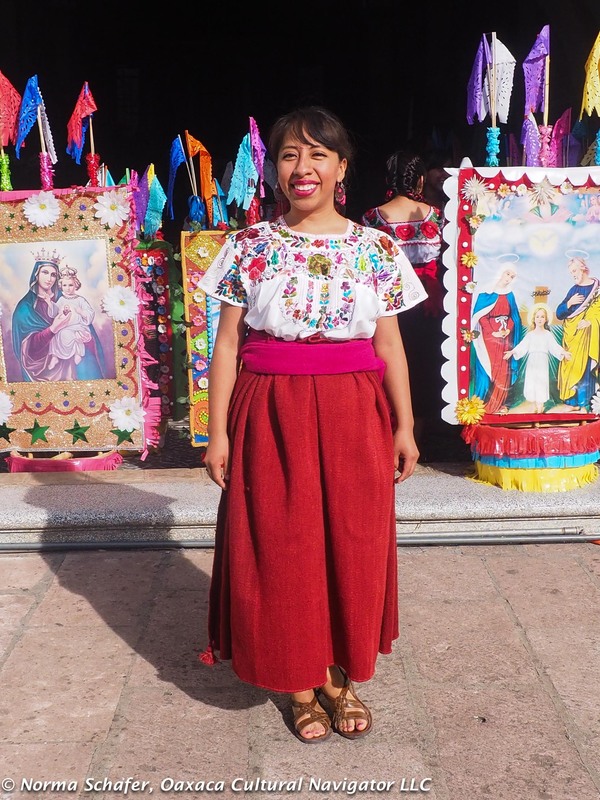 Doña Marina/La Malinche represent the same woman and syncretism of modern Mexico. Yet, this is a personal story about conquest, slavery and how a woman became maligned as part of the cultural history. 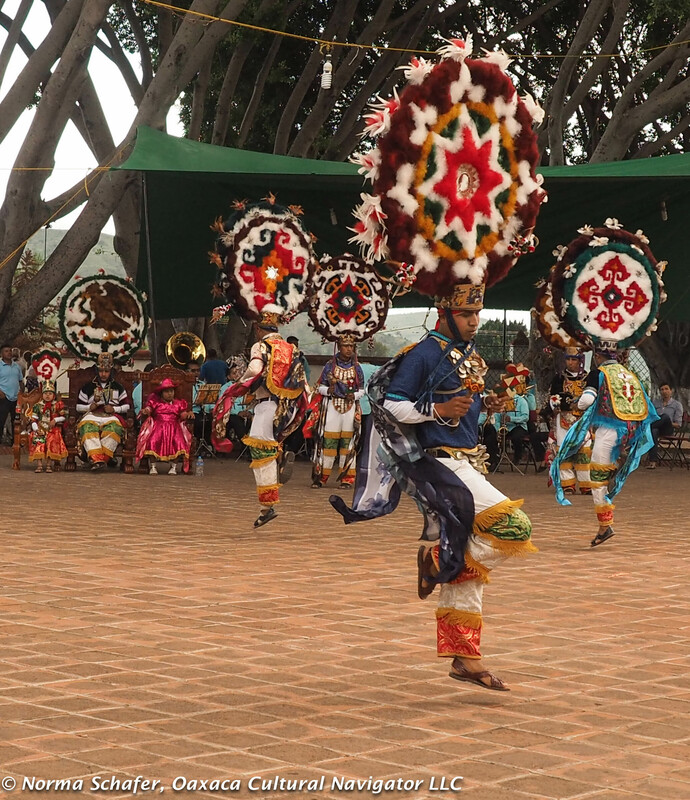 I’ve attended this annual festival almost yearly since 2006, when cousins and nephews of my host family made their three-year commitment to dance in honor of community, religion and customs. Their last dance was in 2009. They dance this way for up to 12 hours, with few breaks. This is the second year for the group that is dancing now. They have one more year, and then the feather headdresses are passed along to the next set of young men. This is not a performance, it is a serious act of commitment. 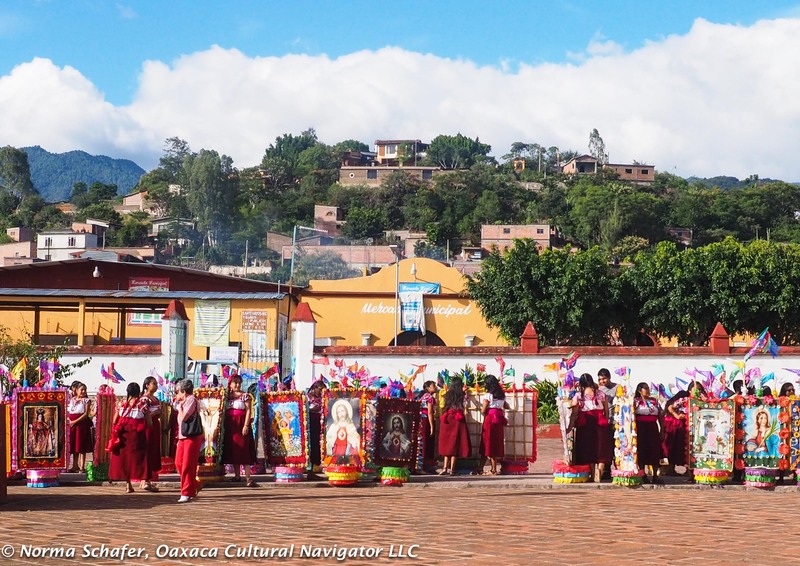 In the church courtyard with sacred mountain Picacho watching over us. As I sat and then stood, and then wandered around the periphery, I was reminded how much energy goes into this endeavor. 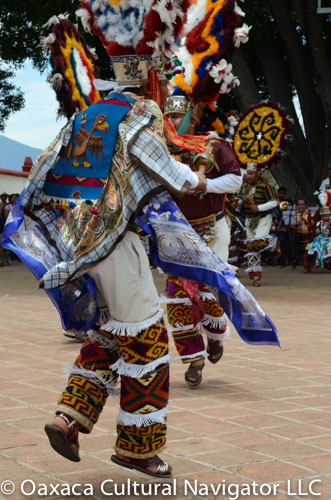 And, how energizing it is to give witness to this tradition that has gone on here for decades, maybe even centuries. The entire pueblo comes out to pay tribute and applause. 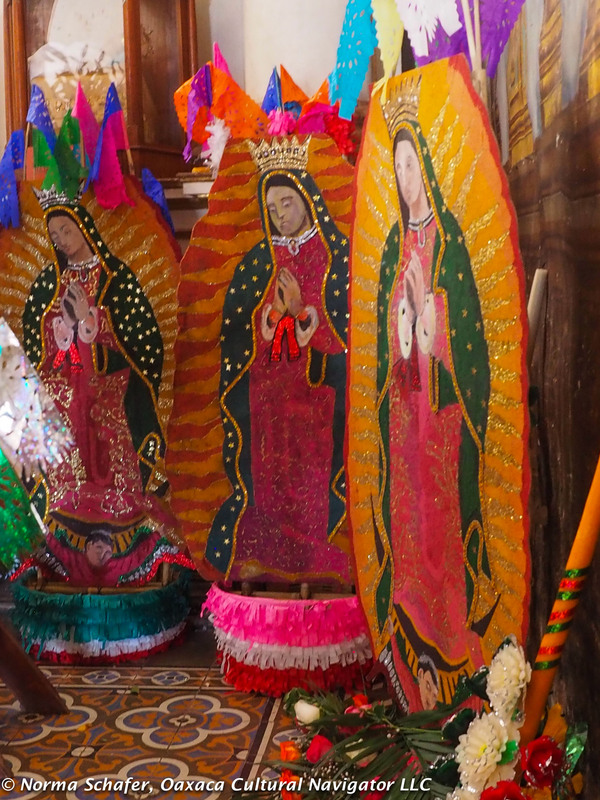 This is a pre-Hispanic tradition that was incorporated, like many others, into the Catholic church saint’s day celebrations. 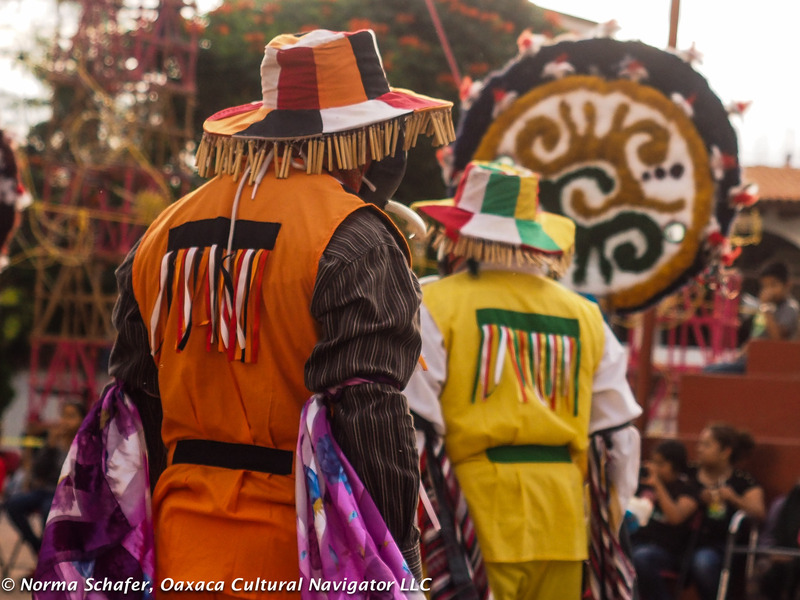 In reality, it is an oral history through dance and mime and music. 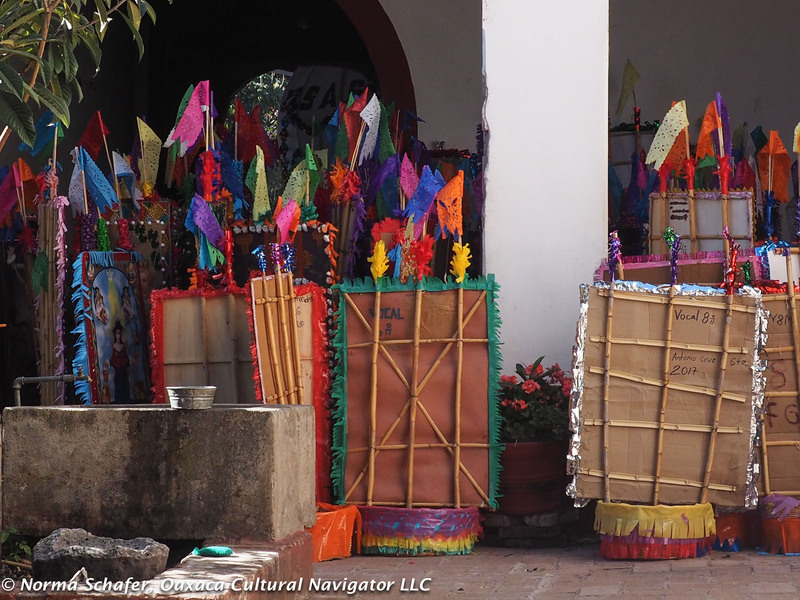 Inside the inner church patio, the canastas (baskets) sit, ready to be stored for another year. 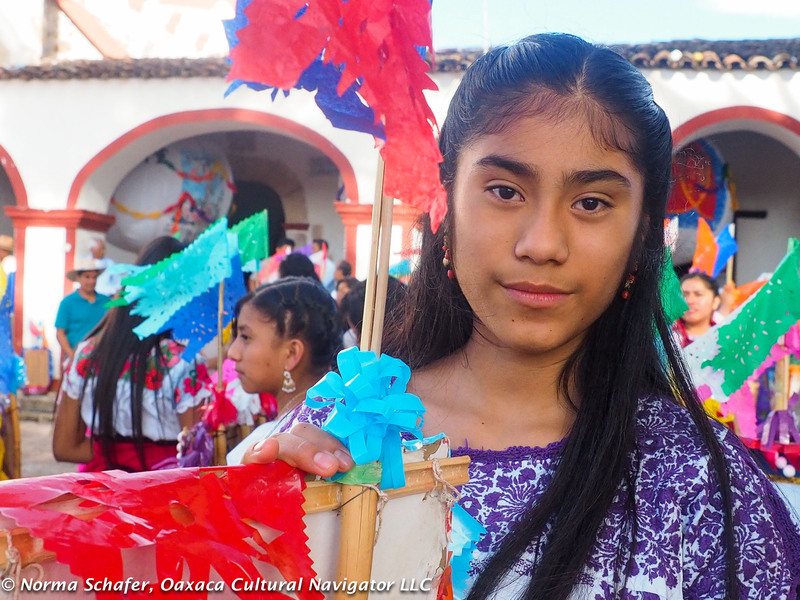 Young girls wearing traditional dress carried them on their heads the night before. 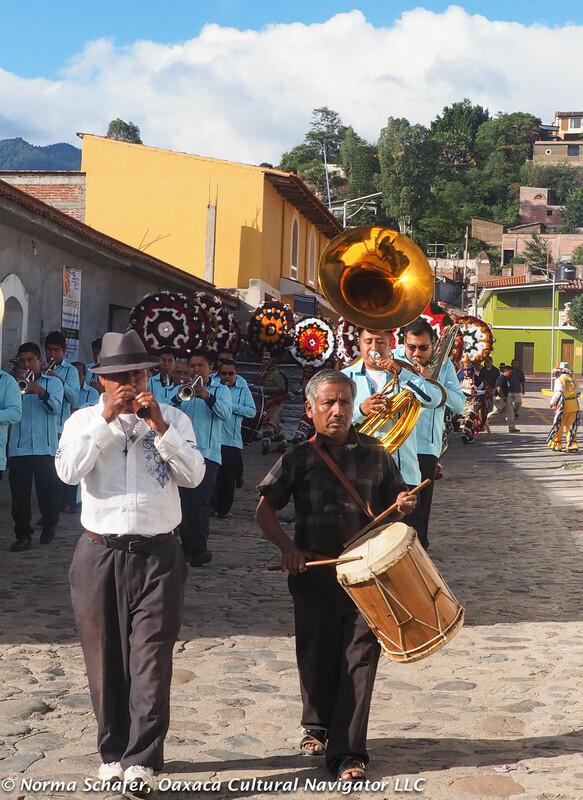 The parade through the streets touches every neighborhood. 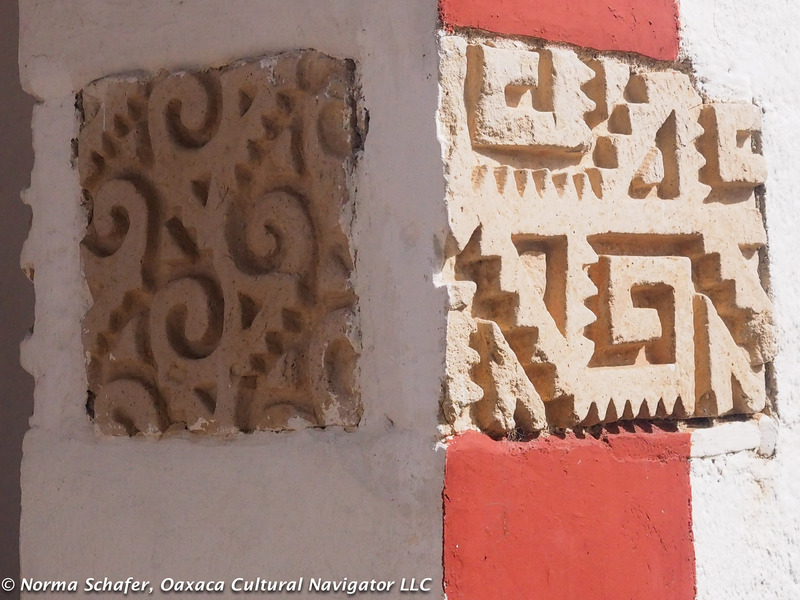 On the other side of the church wall, on the streets surrounding the permanent village market, is a different scene. It’s a carnival. 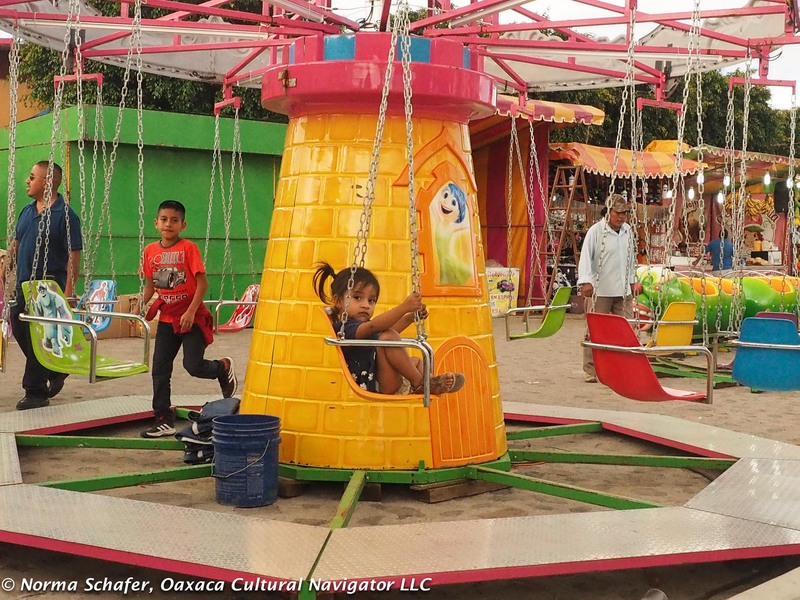 Games, rides, food stands, music compete for entertainment. This experience is mesmerizing for children. It’s like a circus mid-way or a Midwest USA State Fair. The kids love it, pure fun, cotton candy, fast, fast. Take a seat. Grab and go tacos al pastor. Win a teddy bear. Oh, yes, the pastries, ice cream and candy are divine. This is an intricate web of bamboo scaffolding. 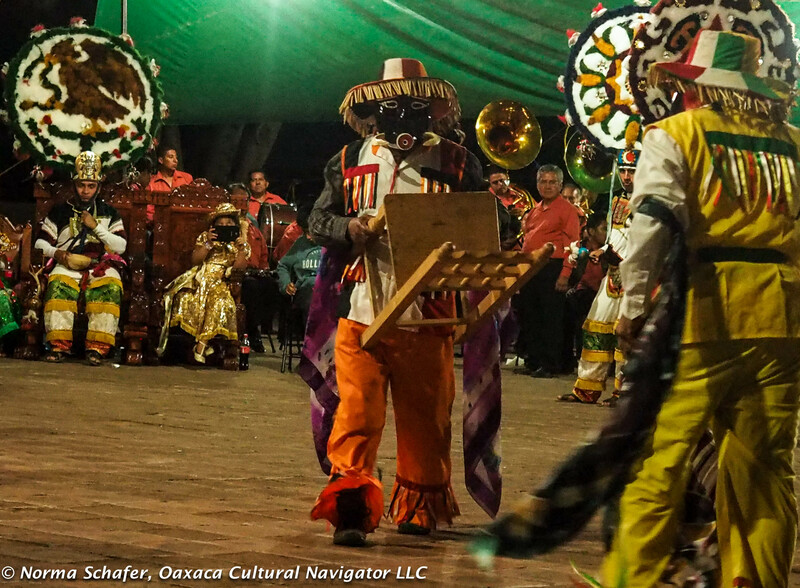 See the Dancer, top left. 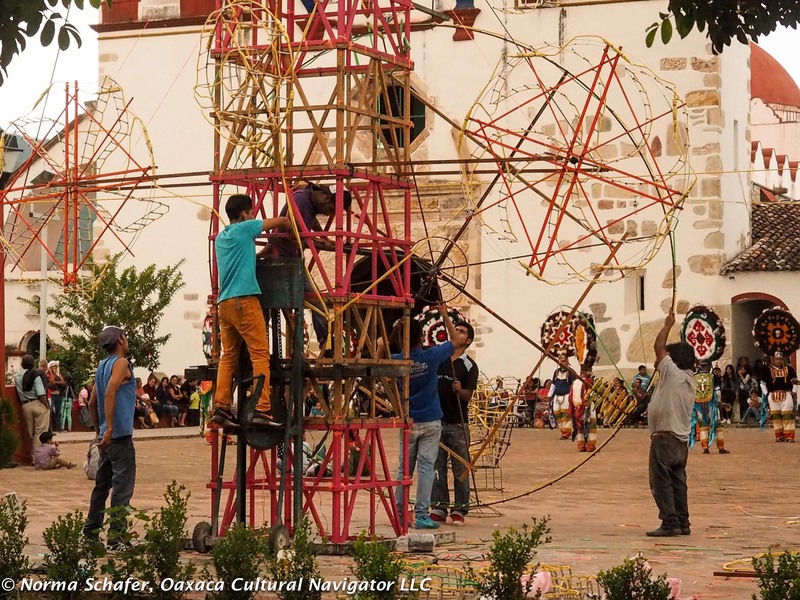 Back inside the church courtyard, the men are setting up the scaffolding and fireworks for the 10:00 p.m. show. It’s called a Castillo or castle. 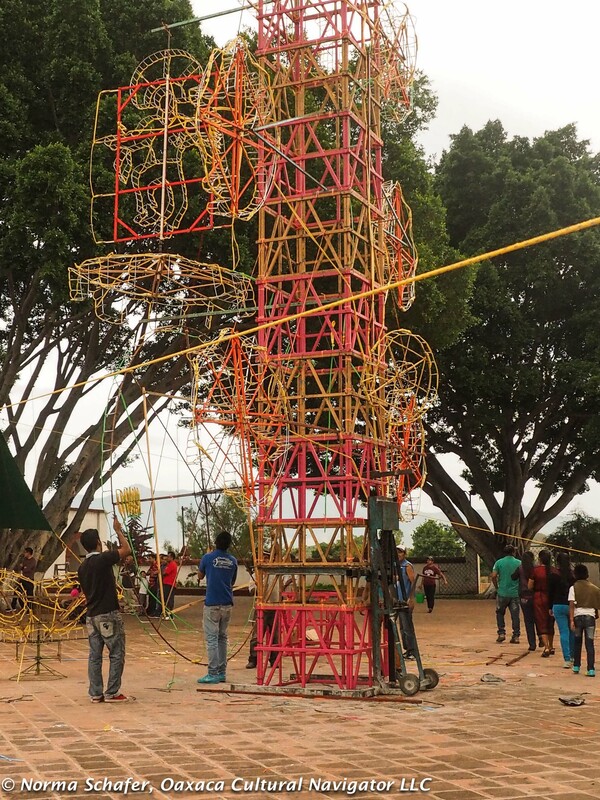 It’s a complex structure of bamboo with spinning parts, explosives attached! 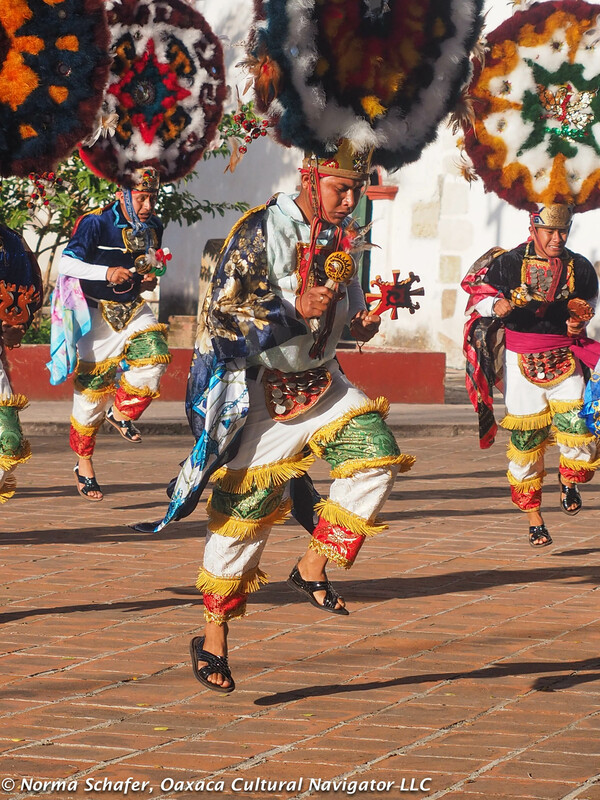 And the dancing continued until sunset — puesta del sol — when the church bells rang and the dancers set their headdresses down on the brick floor until the next day. I couldn’t stay up that late! But, I watched from my rooftop in the distance. 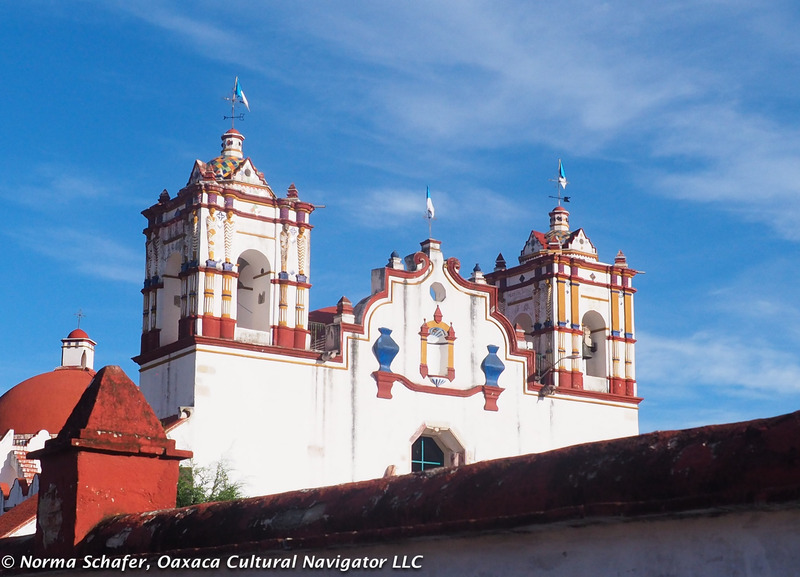 About 500 years ago the Spaniards conquered the Zapotecs of the Central Valleys of Oaxaca. Many indigenous people died, and it is said that the population was reduced by 90% during the two centuries that followed. 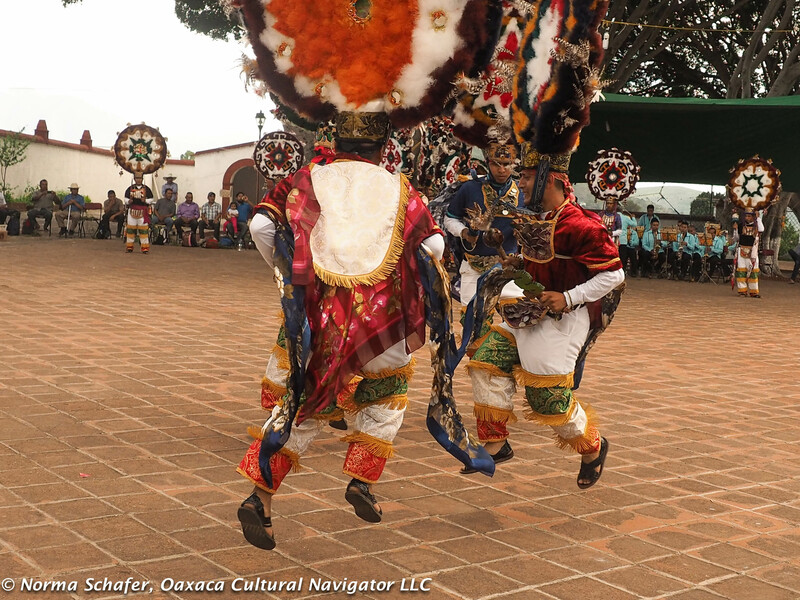 From the stories of the battle, this beautiful dance emerged, which is carried out in certain cities in the center of Oaxaca, and is also a part of the Folkloric Festival called Guelaguetza in late July. 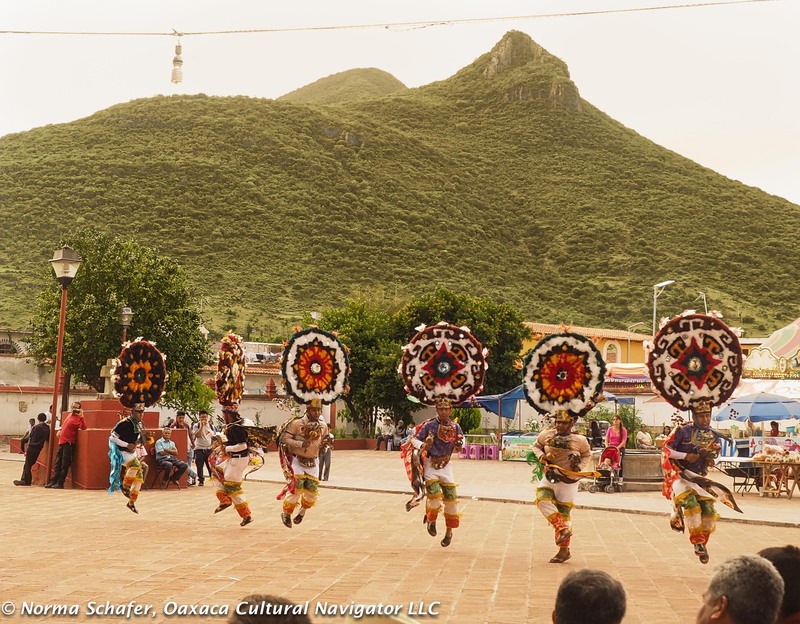 LA DANZA DE LA PLUMA, is originally from the town of Cuilapan de Guerrero, a municipality adjacent to the town of Zaachila and the municipality of Santa Cruz Xoxocotlan. 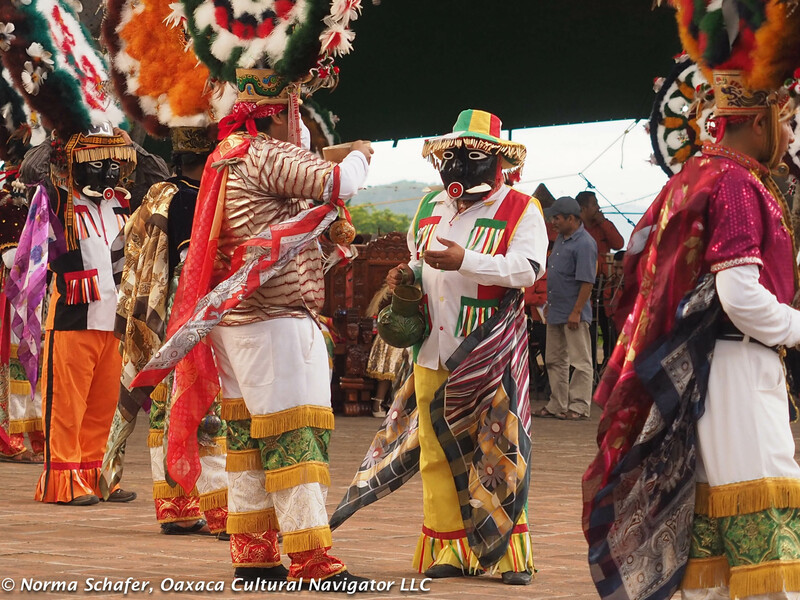 The dance is as old as Oaxaca culture and still preserved. 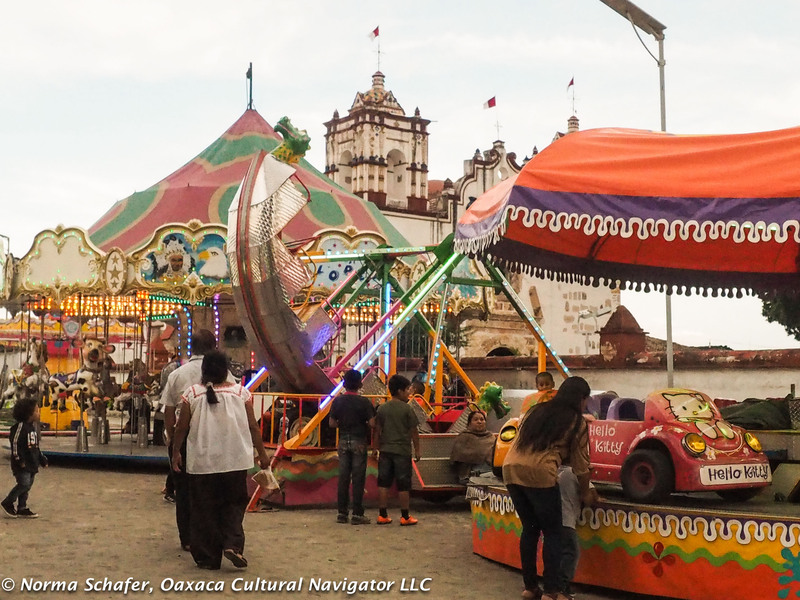 The main characters are a Moctezuma, a Malinche and the converted Malinche who became known as Doña Marina, plus the two jesters or mockers. Balancing this heavy headdress is not easy! 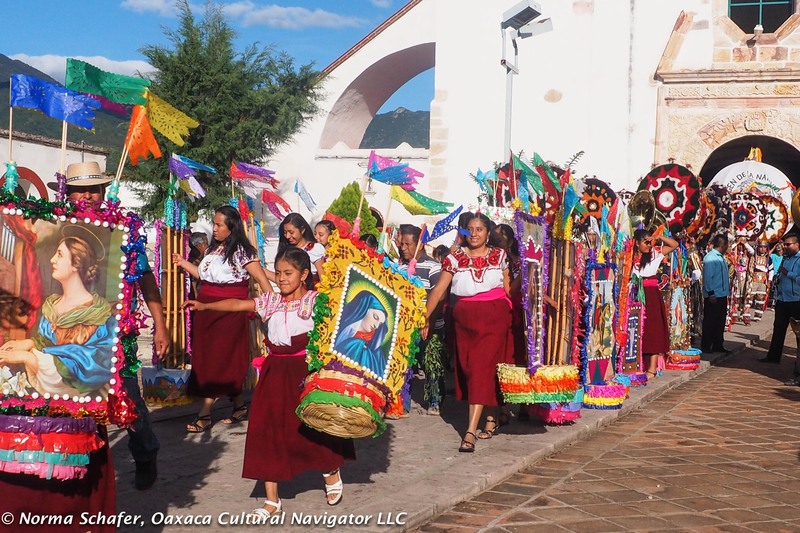 The patron saint of Teotitlan del Valle, Oaxaca, Mexico is the Virgin of the Nativity — La Virgen de la Natividad. It is celebrated here on September 8, today. 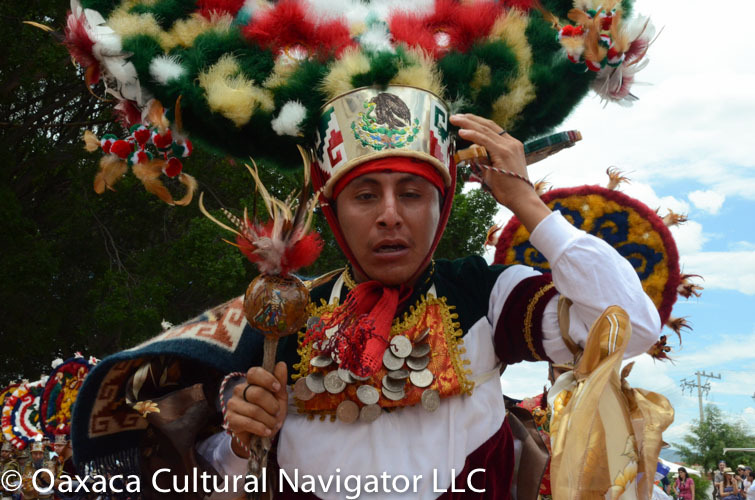 There are two days of fiestas that started on September 6 with a Parade of the Canastas, this year’s group of Las Danzantes de la Pluma (Feather Dancers), and dances and fireworks last night. 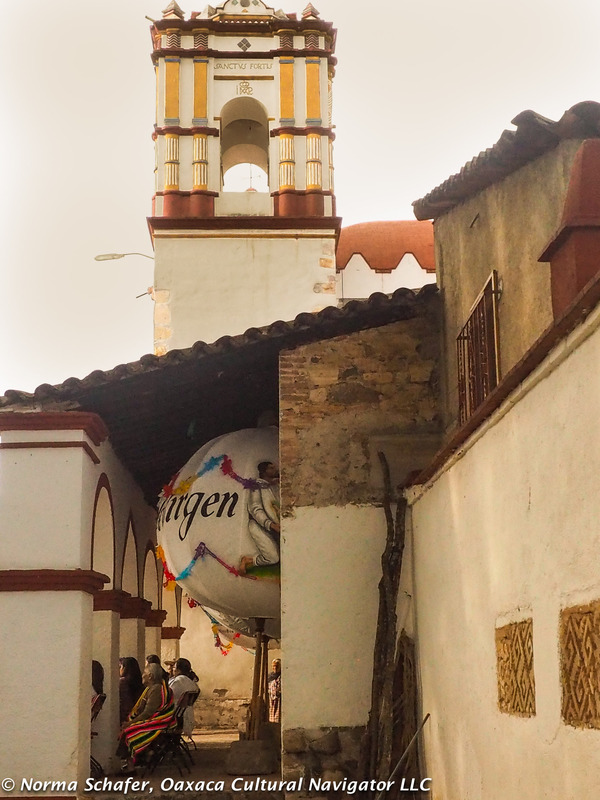 Today, starting at 1:00 p.m., there is a festival all day in courtyard in front of the church. 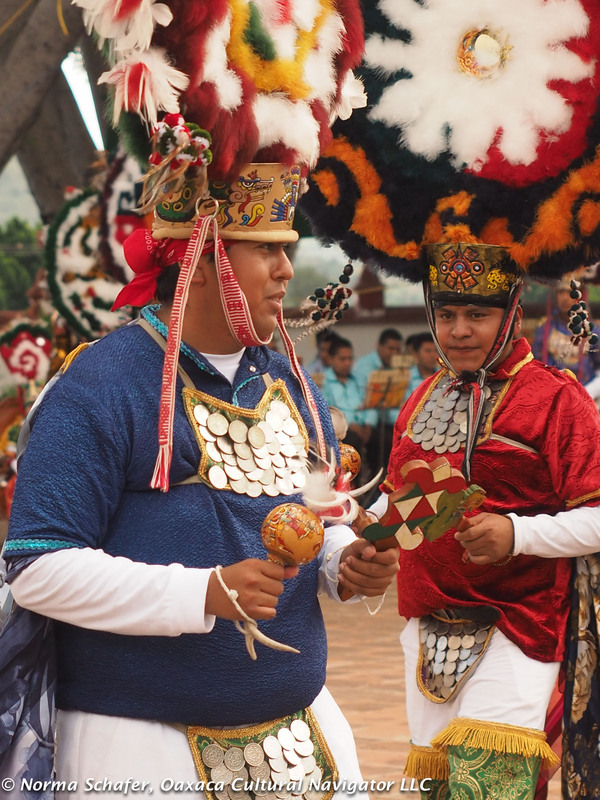 The Dance of the Feathers is a spectacle, but it is also an important three-year commitment the young men make to the church, religious and cultural traditions of the Teotitlan del Valle. 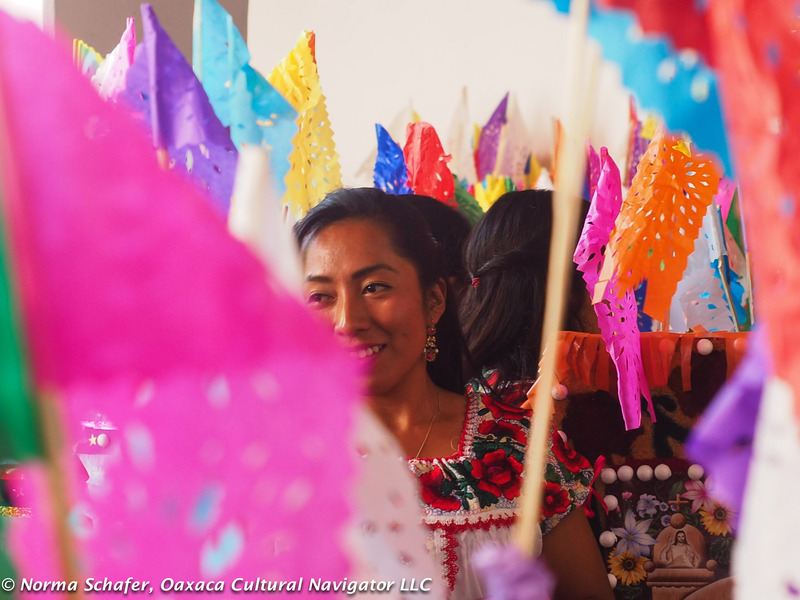 Fiesta time brings live music, traditional dancing, lots of beer and mezcal, and a chance to visit one of the most beautiful villages in the Oaxaca valley. 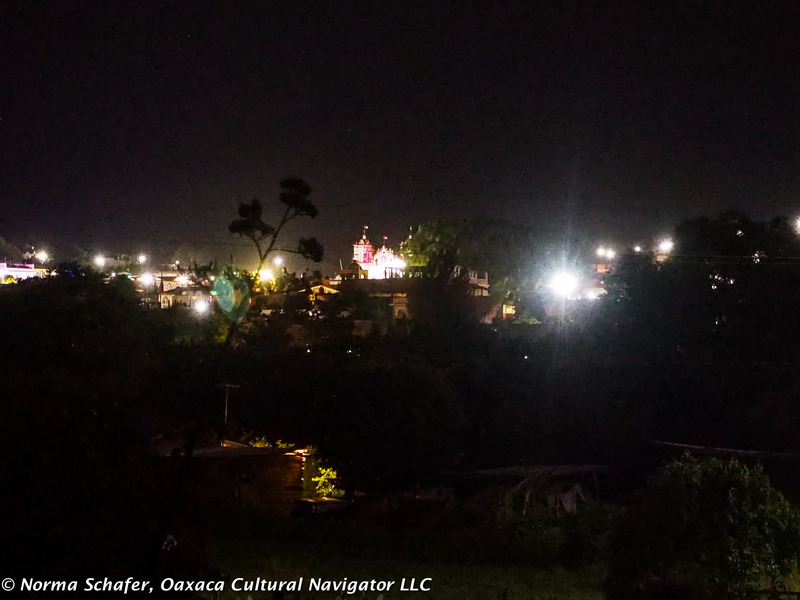 If you decide to spend the night, consider Casa Elena or Las Granadas B&B. Both offer wonderful hospitality. 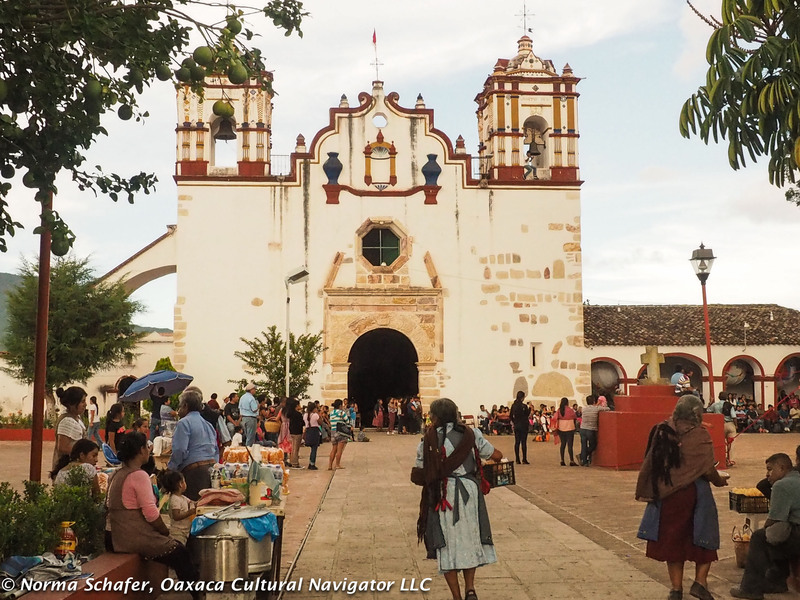 The conquerors of Mexico built churches atop indigenous temples, using the stones and carvings for foundations and to attract the people to the new religion. 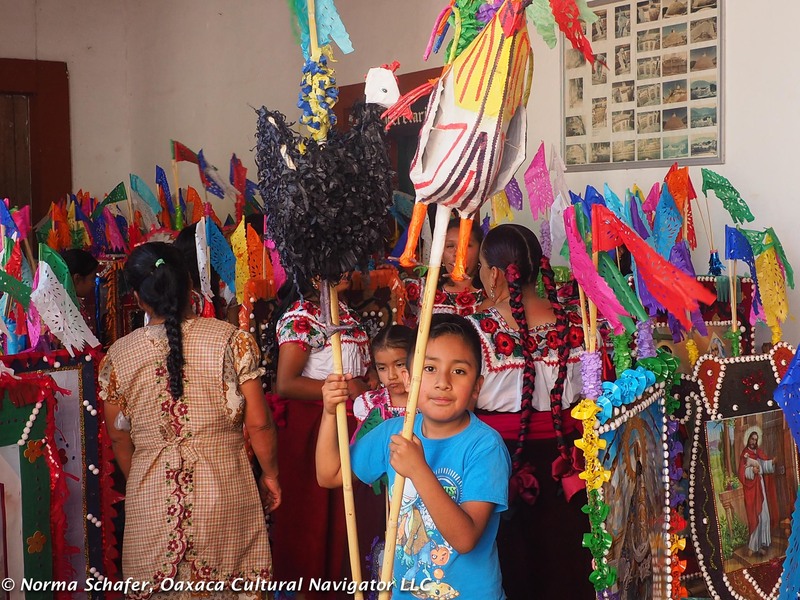 The Dance of the Feathers, or Danza de la Pluma, is an annual tradition in Teotitlan del Valle, Oaxaca, Mexico. 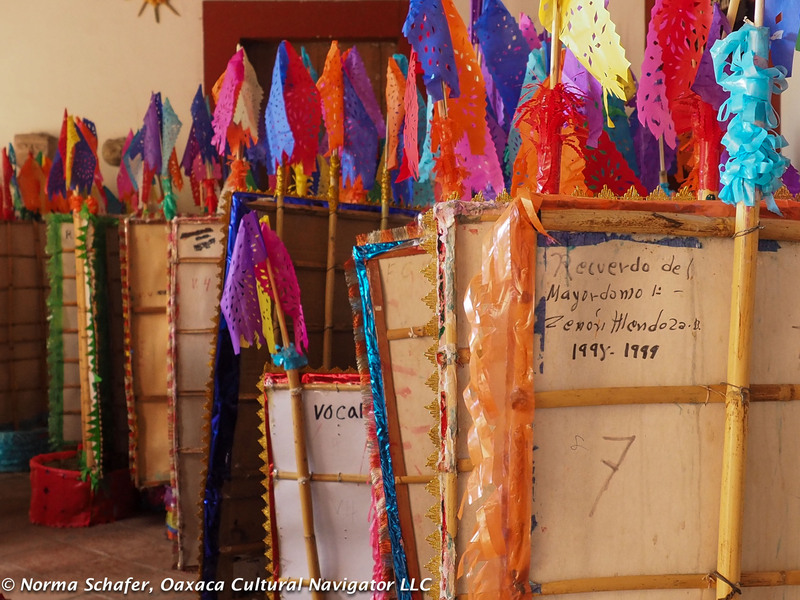 This year festivities start on Monday, July 6 and end on Saturday, July 11, 2015. 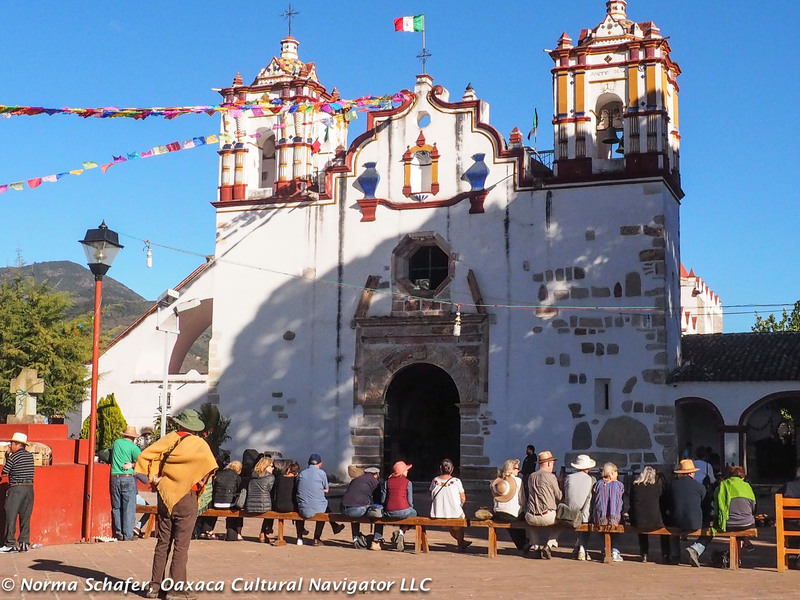 Monday, July 6, about 4 p.m., Parade of the Canastas, Church Courtyard. 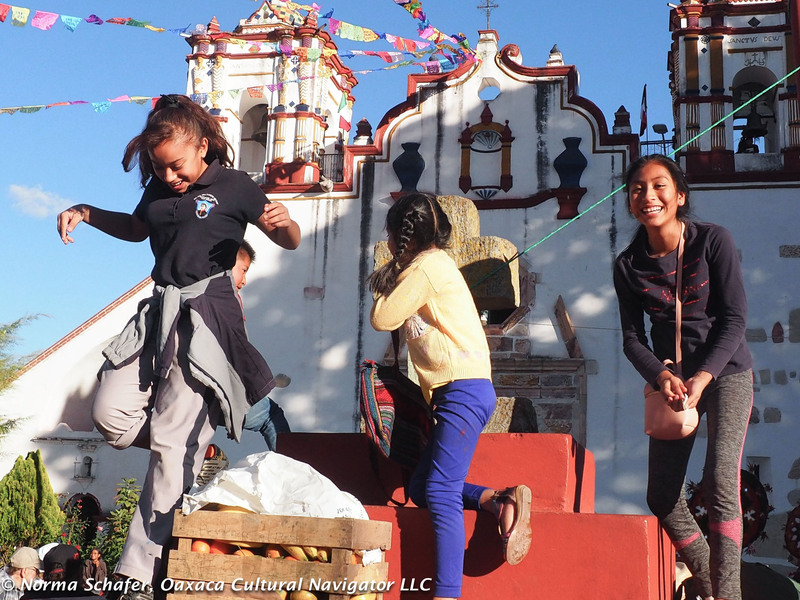 The procession of young women in traditional Zapotec dress and carrying heavy baskets on their heads winds through the cobbled village streets. 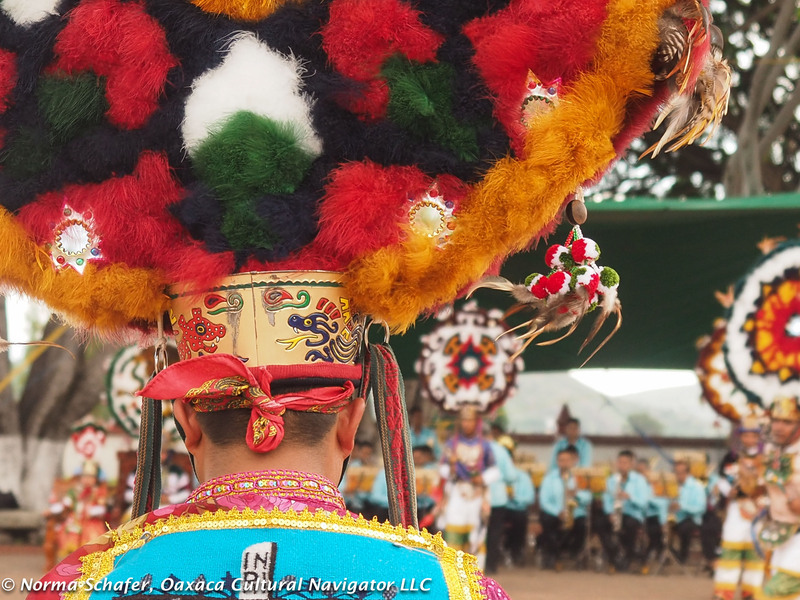 In front of them is the band and coming up from behind are the Dancers in full regalia. There is no dancing today. 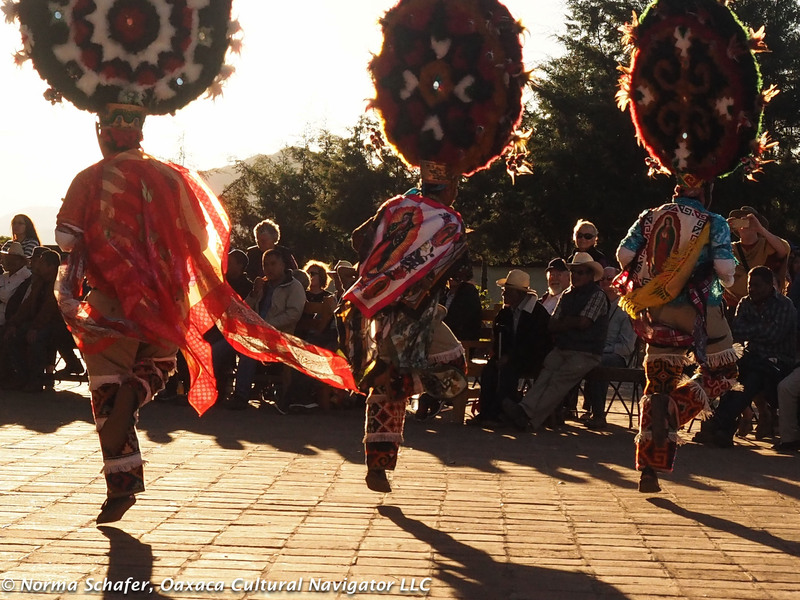 Tuesday, July 7, about 4 p.m., Dance of the Feathers in the church courtyard, continuing until dark, then fireworks display. 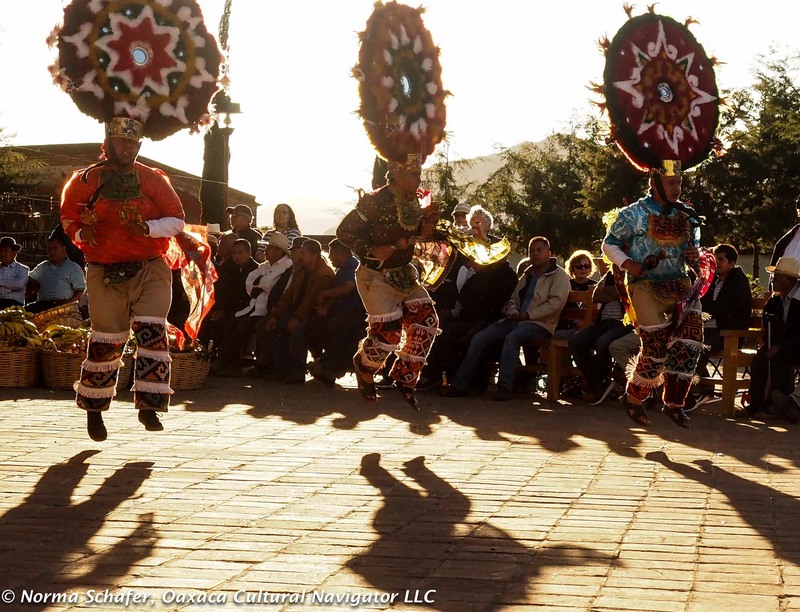 Wednesday, July 8, 12:00 noon until about 8 p.m., Dance of the Feathers. 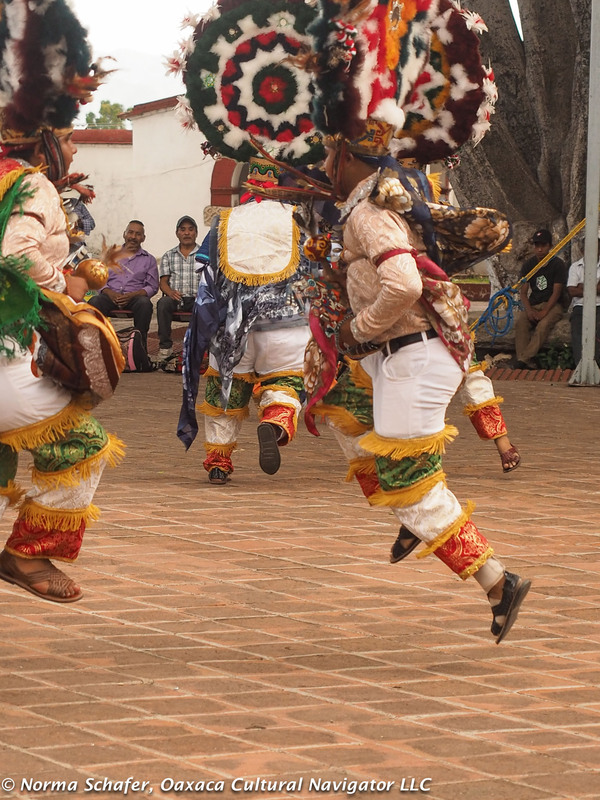 This is the big dancing day when those who volunteer for this ritual and tradition continue almost non-stop all afternoon into the evening. Basketball tourney next to market. 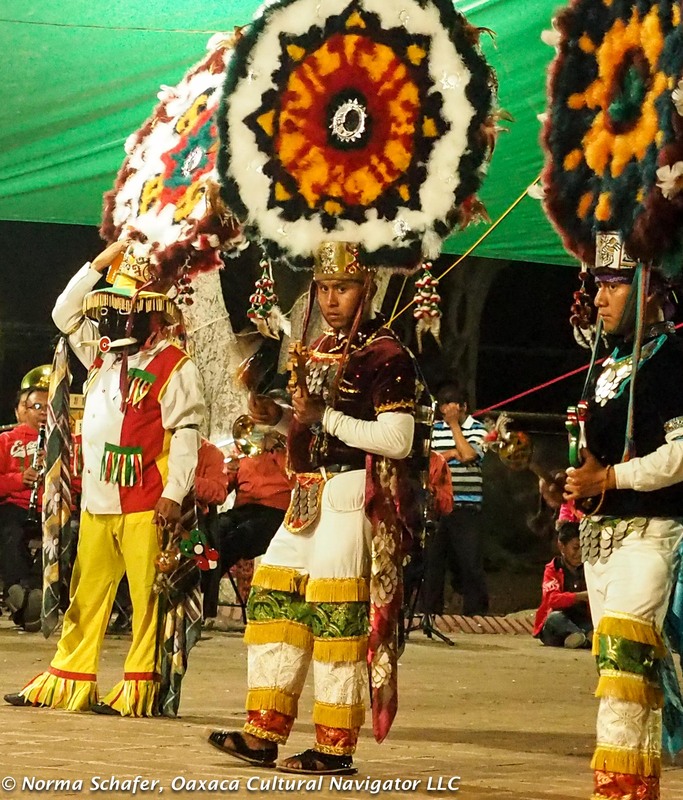 Saturday, July 11, 12:00 non until about 8 p.m., Dance of the Feathers, in the church courtyard, followed by grand finale fireworks, and a public dance complete with band in the municipal building courtyard. 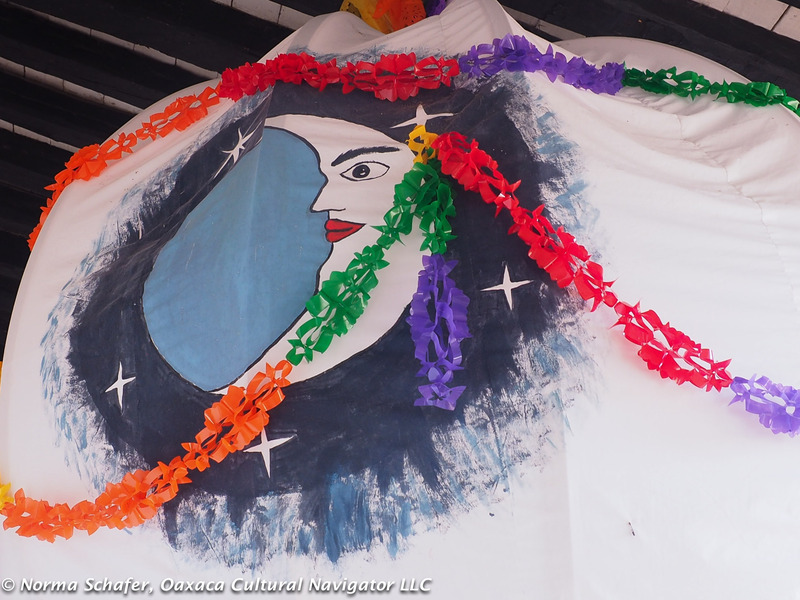 There will be carnival rides, a street fair and lots of food vendors. The almost completed new basketball court next to the village market will hold a tournament there on Wednesday, too. Ojala! Sleep over, if you like. 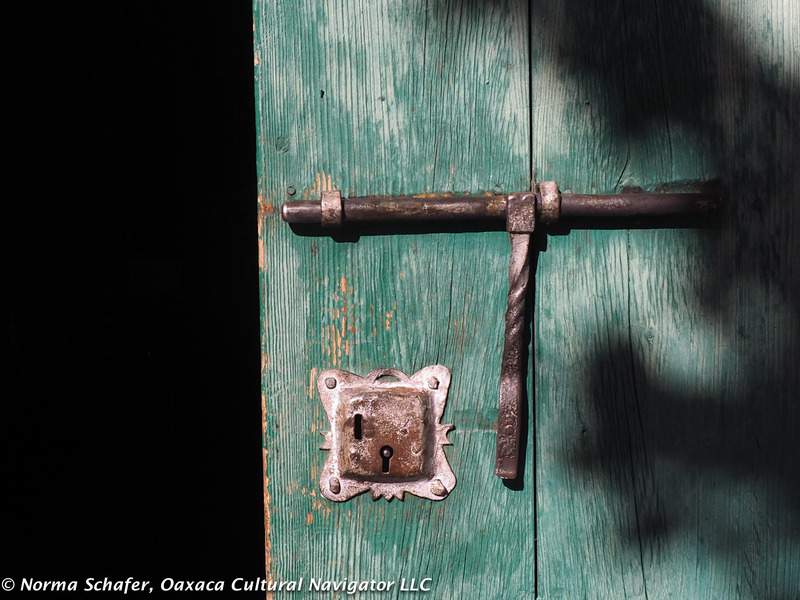 There are good local accommodations at Las Granadas B&B and Casa Elena B&B. You can find them on the internet. I hear some people in the village are renting rooms on Airbnb, too. Enjoy yourself. 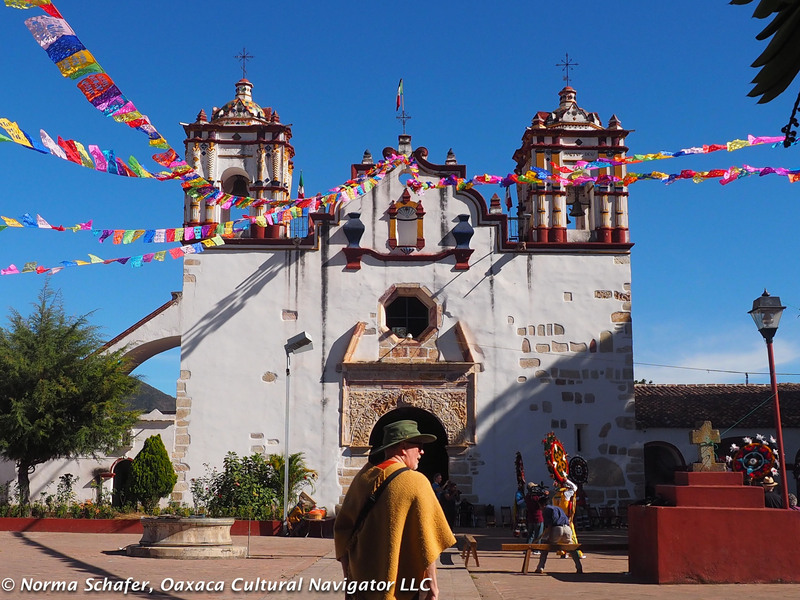 Take lots of photographs and post them on our new Facebook page Mexico Travel Photography. 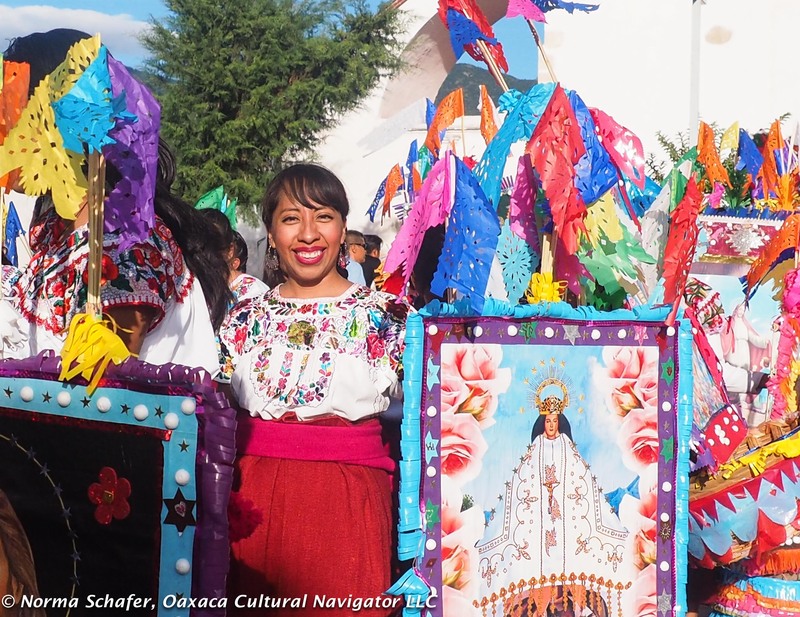 I’m off to the Santa Fe International Folk Art Market for a textile extravaganza on Monday, July 6, so I’ll miss my village’s festivities this year. Send me photos, if you like, to post about what you see and do!